Addictive Pro’s four-track arpeggiator has parameter overrides for each track, giving it considerable poke. 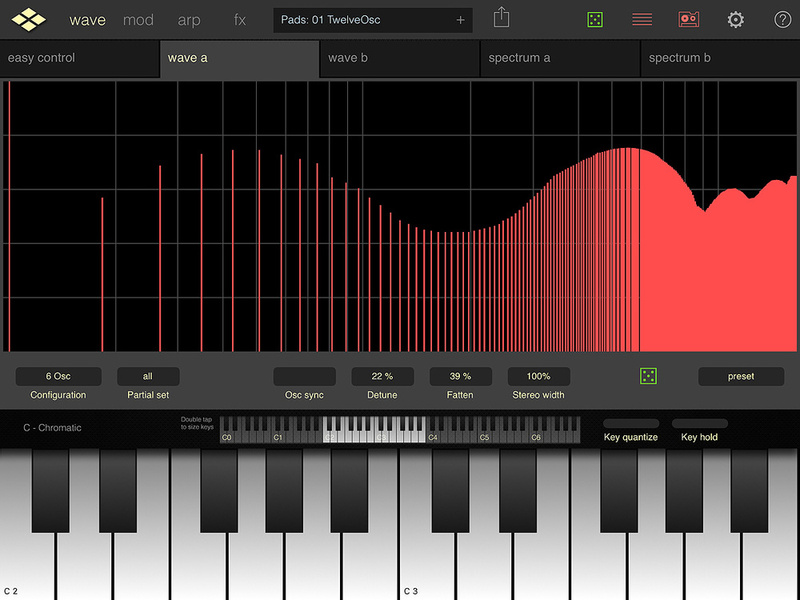 VirSyn’s Addictive Synth has been one of my most trusted music apps for some time, so when I heard there was to be a ‘Pro’ version, naturally I couldn’t resist trying it. Addictive Pro adds more complex oscillator configurations, a better effects implementation and a hot-rodded arpeggiator, but has surprisingly dropped the very useful four-track looper of the original. A quick look around reveals a layout I found instantly familiar. At the top are a series of page entry points — Wave, Mod, Arp and FX — followed by patch selection, access to a (basic) audio recorder and finally the help system. While help is good, it’s no replacement for a full manual, something I hope will be along soon. From the first page, you’re straight into the dual sound generation and filtering processes — Wave A/B, Spectrum A/B — plus ‘Easy Control’. The latter consists of a pair of assignable X/Y pads, the master level and a column of green dice to instantly scramble parameters on all pages. Dice are strewn across most pages and they’re your valuable assistants on days when inspiration is lacking. Addictive Pro features one of the slickest ways of interacting with harmonic levels.The list of configurations for the six oscillators (already pretty comprehensive) has now been boosted by a trio of FM carrier/modulator pairs and three ring modulators. Each wave page sports its own partial set: a pull-down menu from which you can prune some of the 256 harmonics available to each Wave. You can choose to drop all but the odd-numbered harmonics, octave harmonics, prime number harmonics (!) or try a bunch of other relationships you probably never thought of. Experimenting with these, drawing the levels, fattening (adding ‘shadow’ oscillators) and detuning provides a rich sonic palette even before you hit the spectrum filters. Drawing filter shapes is just as rewarding as finger-sculpting harmonic levels, but helpfully, the spectrum filters ship with a set of presets with names such as String Body, Multiband, Unreal, Metallica, plus a series of formants for adding instant vocal characteristics. Playing while drawing is nearly as satisfying as playing and turning a physical knob, hence Addictive Pro is that rare combination of deep and accessible. This is even more the case in this incarnation where the rather untidy ‘Control’ page of old has been ditched in favour of the tab-based ‘Mod’ page; it brings all aspects of modulation together, adding a decent modelled analogue filter in the process. 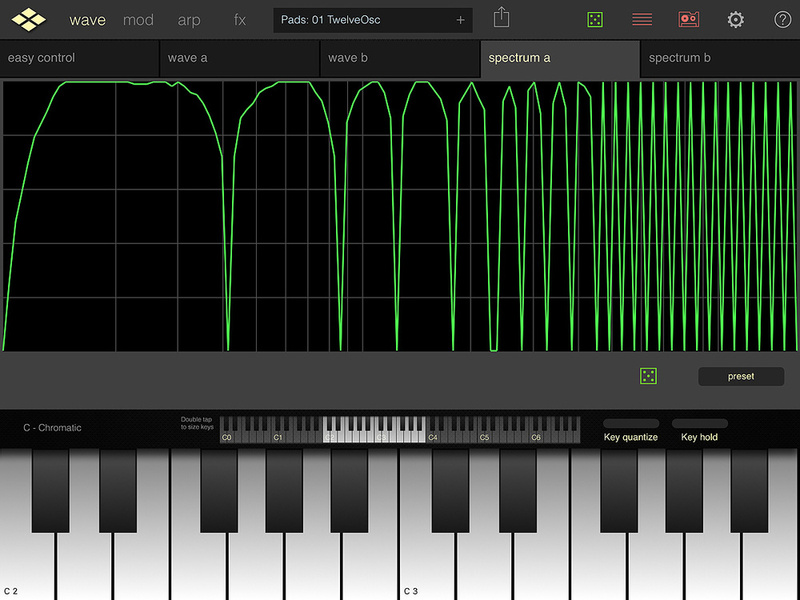 Complex filter structures can be created with simple gestures.This features all the expected modes (at either 12dB or 24dB slopes) and adds a level of more traditional control to the sparkly wavetable oscillators. Usefully, every Mod page option comes with an LFO and envelope. It’s up to you whether these LFOs are monophonic or ‘per voice’. (Polyphony is user-assignable from two to 16 voices.) There’s much to admire on the Mod page but my favourite features are the Morph tab, which allows you to sweep between the two waves, and the Spectral Noise Generator, which has more character and control than a regular white noise dispenser. Dip into the 300 factory presets and you’ll soon have a clear impression of Addictive Pro’s strengths, or you can import sounds made in the earlier app if you have it. I was particularly taken by several lead and ‘keys’ patches, in particular ‘70thLife’, which was smooth and analogue-sounding, and ‘Chimkey’, a bright, responsive and PPG-like creation. Addictive Synth is a killer pad machine, and it seems I’m not alone in this opinion: it’s one of the best-stocked categories, topped only by arpeggios. The arpeggiator is more powerful than average, if pretty densely packed into the slender screen of my iPad Air. Up to four arpeggiator tracks can run simultaneously, and although all use the same sound, each can impose sound overrides on the notes it plays. User-programmable sequences of up to 32 steps, with rests, ties and transposition, are your route to instant complexity and if you enjoy polyrhythms, you’ll love each track’s ‘Tempo Drift’ function, the tempo relative to the first track. You aren’t confined to regular divisions either: all options between 50 and 200 percent are on the table. Oddly enough the keyboard Hold button doesn’t work for the arpeggiator — if you want hands-free arpeggiation you’ll need to select ‘Hold Keys’ from the pull-down Trigger menu. Hopefully this is something that can be tweaked in a future update. As mind-bending as the arpeggiator may be at first, it’s staggeringly comprehensive, if at times simply staggering. To finish off, the FX section’s prize is a reverb with a maximum decay time of 100 seconds — and the quality is pretty sweet too. 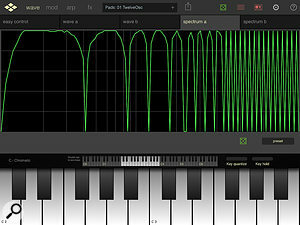 The delay offers the expected clock sync modes and when unquantised, both the left and right channels stretch to 1500ms. Distortion is no slouch either; it includes tape distortion algorithms to take some of the edge off those glistening wavetables. The only real limitation of the effects is the fixed route of the chain, although it’s hard to fault the order chosen for general-purpose use. 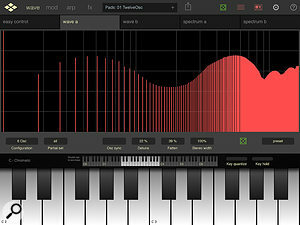 Addictive Pro is a powerful synthesizer app that’s compatible with Audiobus 2 and Inter-App audio. (Support for Ableton Link was added as I began typing this paragraph.) For its detailed sound, deep modulation choices and quality effects, it comes highly recommended. 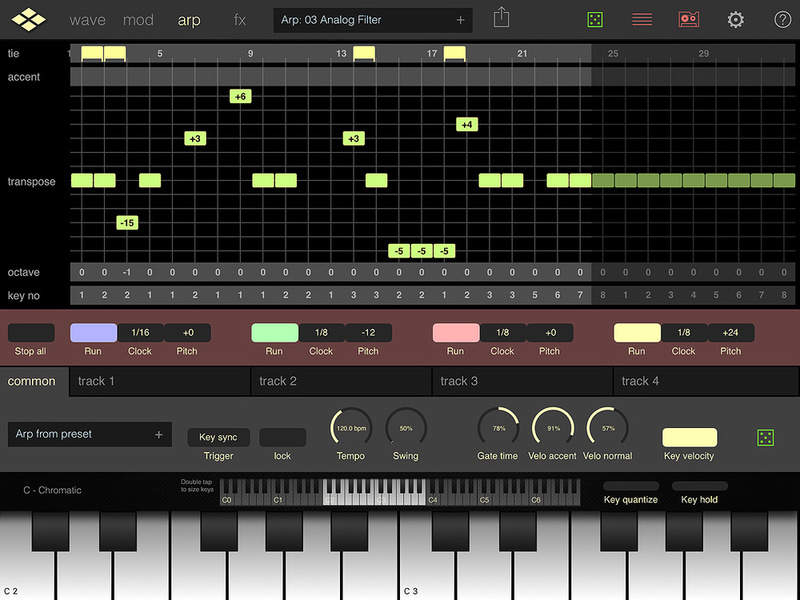 The arpeggiator takes a bit of getting used to but is superior to that of the original Addictive Synth. Personally I’d have preferred a simpler arpeggiator and the earlier app’s four-track audio looper, but other than that, Addictive Pro is a solid step forwards and capable of some truly excellent sounds.